The hijack raises to 12,000, and Adam Goldberg reraises to 30,000 in the big blind. With action back on the hijack, he shoves all in. Goldberg leans back in his chair for over a minute and then asks for a count. The dealer and floor both verify the 161,000 total, and Goldberg goes deep into the tank. After nearly four full minutes, Goldberg moves a stack of chips forward to call. "Nice call," the hijack says to Goldberg as he turns over 7♥3♥. Goldberg shows Q♦Q♠. The flop comes K♣6♠3♣ giving the hijack a pair of threes, but leaving Goldberg's queens well in the lead. The 4♦ turn maintains that lead, but also gives the hijack a gutshot straight draw. A few of the people that have gathered around the table gasp. But the 8♦ river is safe for Goldberg. He wins the pot, and his opponent is sent home as the official bubble boy. The remaining 58 players will now bag and tag for the night. We will bring you a list of all players advancing to Day 2, chip stacks and seating assignments as soon as they are available in the next few hours. We have reached the hand for hand portion of play. Each table will play one hand at a time until we reach the final 58 in the money spots. Gerry Aiello was just eliminated with only three more eliminations to the money. According to Aiello, facing a raise from his opponent, he shoved all in with A♠K♦ and got called by a player holding pocket jacks. Aiello flopped a pair of jacks, but unfortunately his opponent flopped a set of jacks when the flop came K♣J♥X. Aiello was unable to improve on the turn or river and was eliminated in 62nd place, with 58 places paying/making day 2. Only 64 players remain in the final flight of Event #1. When they reach the final 59 they will go hand for hand until they reach all 58 in the money spots. At that time they will bag and tag for the night, returning tomorrow at 12:00 noon. Just shortly after the dinner break, two notable players doubled up to stay alive. Mark Walsh shoved all in holding ace king and got called by an opponent holding pocket queens. Luckily for Walsh, he spiked a king on the river to double. 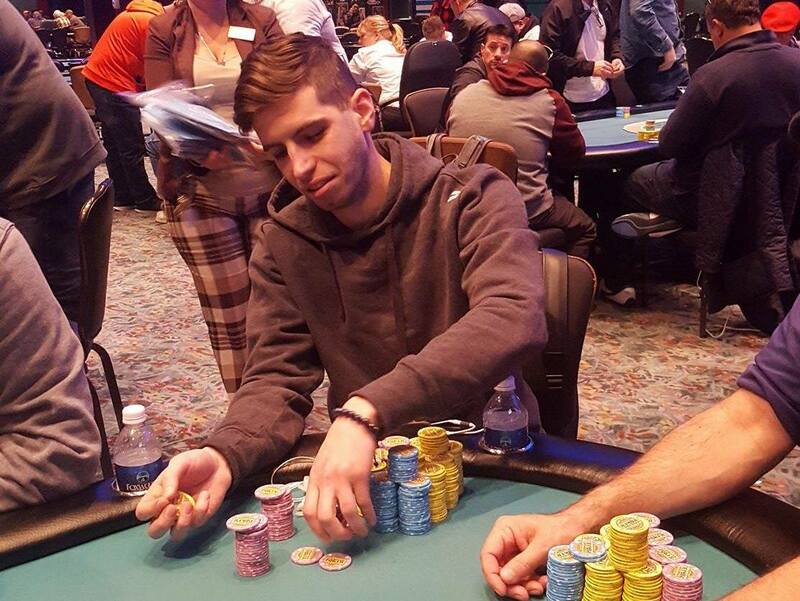 Andrew Lauer also doubled up right after returning from break. According to Lauer, a player in early position min raised, and a player in middle position re-raised to 9,000. It folded to Lauer in the small blind who started the hand with 14,500 and he looked down at pocket jacks. Lauer shoved all in, the player under the gun folded, and the player in middle position called holding pocket queens. The flop came Q♥9♣4♠, giving Lauer's opponent a set of queens, but that didn't scare him in the least. "I feel like I've still got this," Lauer said. His prediction came true, when the K♦ turn and 10♥ river gave him a straight to double and stay alive. The clock reads 137 players remaining in Event #1, Flight D. Those players are now on a 60 minute dinner break. They will return to play Level 14 with 1,000/2,000 blinds and a 300 ante. The field will play down to the final 58 players tonight before bagging and tagging for the evening. They will then join the other players that made it through in the other three flights, to play Day 2 tomorrow (Tuesday) at 12:00 noon. All players making it through to Day 2 will return in the money. We will post a list of updated chip counts upon return from the dinner break. There were a total of 483 entries in today's final flight of the $600 No-Limit Hold'em Re-Entry Event #1. They will play down to the final 58 players before bagging and tagging later tonight. Those 58 players will join the 19 advancing from Flight A, the 29 from Flight B, and the 35 from Flight C to play Day 2 on Tuesday at 12:00pm. As a reminder, all players that make Day 2 will return in the money. The prizepool for this event will be available later this evening, and we will post it as soon as it's calculated. Players are now on their second 15 minute break of the day. They will return to play 300/600 blinds with a 100 ante. Registration will close after the conclusion of this break and no more entries/re-entries will be allowed. We will bring you a list of the final numbers as soon as they are available. According to Dakota Happas he was just eliminated when he shoved all in with aces and got called by an opponent holding pocket kings. There was a king in the window to send Happas to the re-entry cage. His very first hand after re-entering, Happas got it all in on a Q♥J♠10♠ flop holding Ace-king. He was called by a player that flopped the bottom end of the straight holding 9♥8♣. Another player in the hand folded his flush draw on the flop in the midst of the raising war, and would have won as he would have rivered a small flush. Players are just returning from their first 15 minute break of the day. There are currently 388 entries, with 318 remaining. Registration will remain open until the start of Level 9, and entries/re-entries are allowed until that time. Many new faces have joined the field, and the numbers continue to climb in this fourth/final flight of Event #1. Here is a look at the 35 players advancing to Day 2 in the money from Flight C of the $600 No-Limit Hold'em Re-Entry event. These 35 will join with the 19 from flight A, the 29 from Flight B, and any that advance from D, and will return to play Day 2 (in the money) on Tuesday Dec. 6th at 12:00 noon.